This lesson describes the process of selecting the best available climate projection information and using it to develop “climate-adjusted weather” inputs to be used for modeling climate change impacts. These modeled impacts can be used for planning of future water resources. Specific steps of this process include: 1) Recognizing the general science and terms associated with Atmosphere-ocean General Circulation Models (AOGCMs); 2) Making AOGCMs more regionally applicable through bias correction and downscaling; 3) Determining climate change scenarios based on climate projections and selecting specific projections to inform each scenario; and 4) Developing climate-adjusted weather inputs associated with each climate change scenario. See An Introduction to the Downscaled Climate and Hydrology Projections Website for two related videos on how to access downscaled climate and hydrology projections. Really learned a lot from this module, very informative and presented at a reasonable yet intriguing pace. If you're using BCSD data, you should seek to understand the content in this course. The information is well presented and was very succinct; although, given my engineering background It would have been nice to complete maybe a simple numerical exercise to further understand the actual procedures. The short length in each lesson is critical in an online application. I was able to complete the course while doing a few other work related items . Very good lessons and very intuitive lesson display! it is great tool for develop important subjects related the climate change (in my case) and several subjects for learning. I recomend this web program for use, do test, and learn a lot. 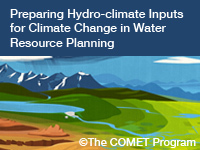 This was a great tool to gain background knowledge on the methods of water resource planning as well as preparing a lab experiment with hydro-climate aspects. The presentation of the material was dry at times which made the lesson less effective. The material seems to be thoroughly covered and well made. Outstanding introduction to climate modeling, particular for professionals who need to use and be able to interpret climate model outputs in their work. Provides a solid foundation of knowledge about the steps and assumptions that go into generating bias-corrected downscaled (BCDS) climate model projections, how to formulate/select climate change scenarios for use in climate impacts assessment, and limitations you need to be aware of when applying/interpreting BCDS outputs. a very good intro in climate modelling even for laymen who want to know how those experts get their opinions about climate change etc.. Determine weather and climate processes that are relevant to the client’s long-term questions about surface hydrology or crop irrigation requirements. Identify and explain issues associated with model resolution and regionalizing, especially with respect to downscaling and bias correction. Explain what BCSD data are. Choose appropriate time steps for characterizing general climate trends as manifested by precipitation and temperature. Evaluate central tendency of temperature and precipitation trends for all model projections taken together. Choose the period change method. Determine how you will define spread. Develop monthly climate-adjusted weather inputs for future surface water hydrology analysis (or crop irrigation requirements) that reflect an appropriate blend of historical observations with simulated trends. Recognize attributes of the observed weather inputs used to develop the climate adjusted weather inputs. Prepare scenarios of future weather inputs corresponding to climate change scenarios, that reflect variability from the observed weather and trends from climate simulations. Prepare results using both the Delta (single projection informed) and ensemble informed Delta methods. Disaggregate monthly climate-adjusted weather inputs into daily climate-adjusted weather inputs. Part 1 of this 5-part lesson was revised slightly in 2016 to acknowledge the latest information associated with IPCC Assessment Report 5, AR5. The methodologies demonstrated in parts 2-4 are still based on the IPCC AR4 report which used the Coupled Model Intercomparison Project 3 (CMIP3) models. One can use the CMIP5 models associated with IPCC AR5 (2014) and apply the same methodologies described in this lesson.